2 lasers were not powerful enough to overcome the thermal conductivity of metals. 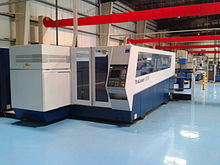 HACO fiber laser cutting machine with an integrated loading and unloading system. 2 and Nd/Nd:YAG lasers can be used for welding. 2 lasers are used for industrial cutting of many materials including titanium, stainless steel, mild steel, aluminium, plastic, wood, engineered wood, wax, fabrics, and paper. 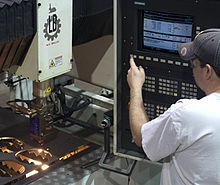 YAG lasers are primarily used for cutting and scribing metals and ceramics. 2 lasers include fast axial flow, slow axial flow, transverse flow, and slab. In a fast axial flow resonator, the mixture of carbon dioxide, helium and nitrogen is circulated at high velocity by a turbine or blower. Transverse flow lasers circulate the gas mix at a lower velocity, requiring a simpler blower. Slab or diffusion cooled resonators have a static gas field that requires no pressurization or glassware, leading to savings on replacement turbines and glassware. Laser cutters have positioning accuracy of 10 micrometers and repeatability of 5 micrometers. Standard roughness Rz increases with the sheet thickness, but decreases with laser power and cutting speed. When cutting low carbon steel with laser power of 800 W, standard roughness Rz is 10 μm for sheet thickness of 1 mm, 20 μm for 3 mm, and 25 μm for 6 mm. cutting speed in meters per minute. 2 Lasers." UC Berkeley. UC Berkeley, n.d. Web. 14 Jan. 2015. ^ a b Todd, p. 186. 2 - Boss Laser Blog". Boss Laser Blog. 2017-05-22. Retrieved 2018-04-24. ^ "Research on surface roughness by laser cut by Miroslav Radovanovic and Predrag Dašić" (PDF). ^ Caristan, Charles L. (2004). Laser Cutting Guide for Manufacturing. Society of Manufacturing Engineers. ISBN 9780872636866. ^ Forsman, A; et al. (June 2007). "Superpulse A nanosecond pulse format to improve laser drilling" (PDF). Photonics Spectra. Retrieved June 16, 2014. ^ http://www.laserline.de/tl_files/Laserline/downloads/broschueren/en/Laserline_Image_high_power_diode_laser.pdf - Page 4:"High electrical/optical efficiency of up to 45%"
^ Todd, Allen & Alting 1994, p. 188. ^ "Laser Cutting". Laserage. Retrieved 2016-08-23. Oberg, Erik; Jones, Franklin D.; Horton, Holbrook L.; Ryffel, Henry H. (2004). Machinery’s Handbook (27th ed.). New York, NY: Industrial Press Inc. ISBN 978-0-8311-2700-8. Wikimedia Commons has media related to Laser cutting.